What Makes a Book Real? I looked at the book. It was called The Novel, which I’d never heard of or read, though James Michener had been my mother’s favorite author. It wasn’t until I’d gone off to college that I learned that there was anything wrong with that. An entertainer for the masses, one of my professors had scoffed after inquiring what books I’d read. Michener, he advised me, was not the kind of writer I should bother with if I truly wanted to be a writer myself. I felt like a fool. All those years as a teen, I’d thought myself sophisticated when I’d been absorbed in Poland and The Drifters, Space and Sayonara. In my first month of college, I quickly learned that I knew nothing about who was important and who was not. “You know this isn’t a real book,” I’d said disdainfully to my mother when someone had given her Michener’s Texas as a Christmas gift later that year. Michener wrote 57 books in his lifetime, 26 of them fiction and several of them bestsellers. He won the Pulitzer Prize and Presidential Medal of Freedom for his work. 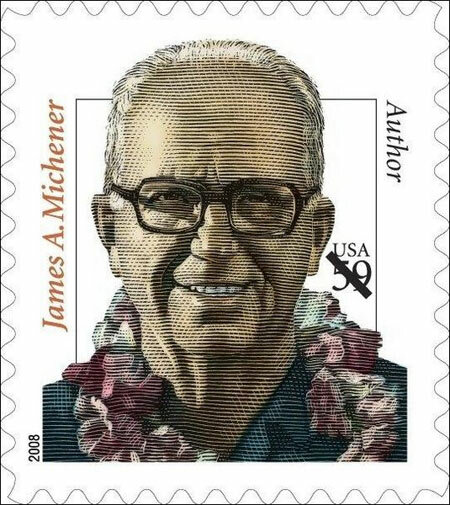 In 2008, an honorary portrait of Michener was printed on US postage stamps. Michener’s legacy now continues at University of Texas at Austin’s Michener Center for Writers, one of the most competitive and distinguished MFA programs in the country. The program provides full funding for all their students and only accepts about 1% of applicants. I don’t think many people would “scoff” at that now.